Of all the skills that the engraver should master, shading could be considered one of the most difficult. Why? Because fineline shading requires the highest degree of graver control, since the cutting is extremely delicate. Consistent spacing is critical, and any irregularities stand out like a sore thumb. 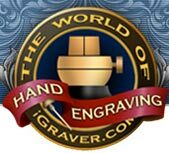 It goes without saying that the best shaders in the engraving world have developed an instinct for shading an endless variety leaves, stems, and scrolls. They can quickly eye a portion of the design and know exactly how to shade it to perfection. This skill takes time to develop, and is one of the most difficult things to teach. 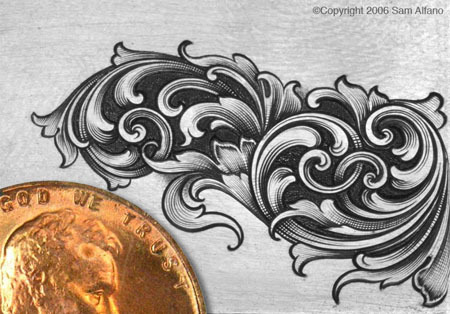 The beginner should start by shading classic, spiraling scrollwork, while studying the works of other engravers to see how they shade similar elements, and cut his or hers accordingly. While the leafier and more random Arabesque designs are popular, the student should master scroll shading before progressing to wider, leafier designs which are considerably more difficult to shade. The goal of fineline shading is to achieve a three-dimensional look on a flat surface. With good shading, intertwining stems and leaves give the illusion of overlapping, with dark and light areas indicating high and low areas. The shaded areas should have absolutely smooth transitions from light to grey to black. This can only be accomplished with perfect control of the graver and good instincts on how each leaf should be handled. When cutting fine shading, I use a 120° graver with a 45° face and 15° heel. Since the 120 incises a much wider V than a square (90°) graver, you might think it would be unsuitable for the ultra fine cuts that fine shading demands. This is definitely not the case. The 120° tool works exceptionally well for the finest of shade cuts. One of the most important things to learn about shading is how to start with a micro-thin line and get wider and deeper as the cut progresses. To achieve an extremely fine line at the beginning of the cut, the graver's heel scoots across the surface of the metal a small ways before it enters the metal and produces a curled chip. This very thin beginning to the shade line is extremely important to successful shading, and should be practiced until perfected. As the cut progresses, the line will gradually get wider and converge with adjacent lines to produce a dark area at the base of a leaf or an overlapping stem. With an extremely fine start, consistent spacing, and a progressive widening of the cut which converges with adjacent cuts, the overall effect with be smooth transition from light to grey to black. This light to grey to black transition is the hallmark of fine shading. While more lines generally look better and produce smoother results than a few lines, avoid the temptation to fill areas with with too many cuts. Shading certain elements with restraint will be the best approach, because it's not always what you engrave that makes you a good engraver, but what you don't engrave. Here are two examples of shading a common component found in scrollwork and other ornamental designs. Example 1 shows shading lines which do not follow the flow and growth of the design, and this spoils the effect. Example 2 shows shading lines that follow the stem's growth, creating a smooth, flowing design. The lines converge as they get close to the bottom of the stem, creating a gradual shading from light to grey to black. Shading lines in example 1 show a lack of taper, and all lines being heavy weight make proper spacing impossible. There's very little life and softness to the shading...in fact it can hardly be considered shading. The lines cut in example 2 are thinner, but spaced entirely too close and also lack correct tapering. As you can see, the leaf is a high contrast light or dark with hardly any soft, grey areas. Crosshatching worsens the effect, making the leaf even darker. Example 3 shows lines that are tapered nicely and converge as they progress down the leaf. You'll notice that one half of the leaf is shaded lighter than the other side, and this is accomplished by a slight increase of spacing between the cuts. A small area of space below the separation of the leaf edge is left unshaded. The creates the illusion that this portion of the leaf is higher than the surrounding areas. You'll notice this technique in finer examples of furniture carving, bronze sculpture, as well as old examples of printed acanthus leaf ornamentation as on a U.S. One Dollar note. Small scrollwork (about 25mm long) showing many beveled cuts of varying width and depth, followed by stippled background and fine, single-point shading. Note how crosshatching adds depth and dimension and increases the illusion of 3D. All work done with the GRS GraverMach and Monarch handpiece.